The South Carolina Gazette contained advertisements that called for the merchants to meet at Dillon’s Tavern and the mechanics and planters at the Liberty Tree to discuss the Townsend Duties Act. All agreed that “taxation without representation” was the main grievance. 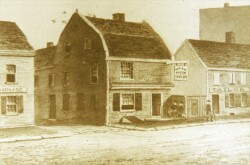 Menassah Cutler, noted in his journal that he saw James Madison, George Mason, Alexander Hamilton, John Rutledge and Charles Pinckney having dinner at the Indian Queen Tavern at the corner of Market and Third streets. Most historians interpret this meeting as a backroom deal on the slavery question. Pierce Butler of South Carolina introduced the Fugitive Slave law.